Texas (-17) vs. Maryland: This is an interesting number to start with. Maryland isn't good. D.J. Durkin is a solid coach, but he took over a much bigger mess than he thought, and it's a rough road. They are going to struggle to be competitive here or all year. Texas, though, is a bit of a mystery. The hype is out of control for new coach Tom Herman. They have some talent, but they are facing a massive change, and they need some serious work on their mindset. This number is higher than it should be because of that optimism and because one team is so wildly public while the other really, really isn't. I can't get excited about Texas at this number, but I dislike Maryland so much that I can't justify betting them, either. This feels like a textbook game to pass. 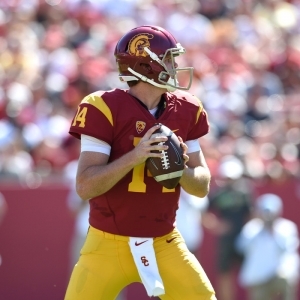 USC (-27) vs. Western Michigan: Sam Darnold walks on water and is singlehandedly going to save the world. Surely you've heard that. The hype there is even more extreme than it is for Texas. The public is absolutely starved for a world in which USC is a force again. That creates the same as the last game - USC is a nice team, but are they nice enough to justify this big price? Western Michigan has gone through major changes, and lost their great coach, but they aren't a total disaster. Is USC good enough to win this big? And do they care enough to win by four or more touchdowns? They are probably fine but not fine enough to make this game interesting on either side. Iowa (-12.5) vs. Wyoming: If you are looking for an upset special to make fandom interesting in the first week then Wyoming could be it. Iowa is solid, but they certainly have some questions to answer. Wyoming has gone through a lot of changes, but Josh Allen is poised at this point to be perhaps the top pick in the draft, and Craig Bohl is one heck of a coach. The team will be fired up for this one, and they made a very good hire at defensive coordinator to hopefully fix some serious issues there. This one could definitely get interesting, and the underdog is very attractive. Georgia (-13.5) vs. Appalachian State: The story is much the same as the last game. Georgia should be pretty good, and has solid expectations, but there are questions to answer, too. Appalachian State is a team that is easy to overlook. They have more questions this year than at other times, but they are well coached and are always ready for big games. Georgia is better and should win, but I wouldn't argue with anyone looking at the underdog play here. It's not as nice as the last price but still interesting. Louisville (-25) at Purdue: This is another interesting underdog play. Louisville has the defending Heisman winner at QB, and Purdue has been lousy for a very long time, so the likely winner is clear. I don't mind betting Purdue to cover, though. There are a couple of reasons. First, I just don't trust Louisville's mindset this year. They just aren't as tough as I wish they were. Second, Purdue is going to be amped for this one. New coach Jeff Brohm, who is excellent, is going to have his squad fired up for this game. He wants to get a strong start anyway, but both him and his brother and offensive coordinator Brian are former Louisville quarterbacks. They will be particularly ready for this one. They won't do enough to win, but at home they could do enough to keep it close enough to cover. Virginia Tech (-4.5) vs. West Virginia: The Hokies face some changes, but they are very well coached, have a lot to build on from last year, and should be solid. The upside is 10 wins, though eight or nine is more likely. West Virginia, meanwhile, is a team I find it easy to hate this year. They are facing a lot of changes, their coach is a mess who should have been gone already, and they are short on talent. The Hokies are a very comfortable pick here in my eyes. Wow! Doc's Sports college football picks are free! New clients can get $60 in expert football picks from any handicapper on Doc's Sports Advisory Board. There is no obligation for this offer, and no salesman, ever! Click here to get your picks - it takes less than 2 minutes to sign up ! Also, get three handicappers for the price of one when you sign up for a full-season football package! Click Here for details . Click Here for details . Get free weekly free college football picks at Doc's Sports free football picks page .